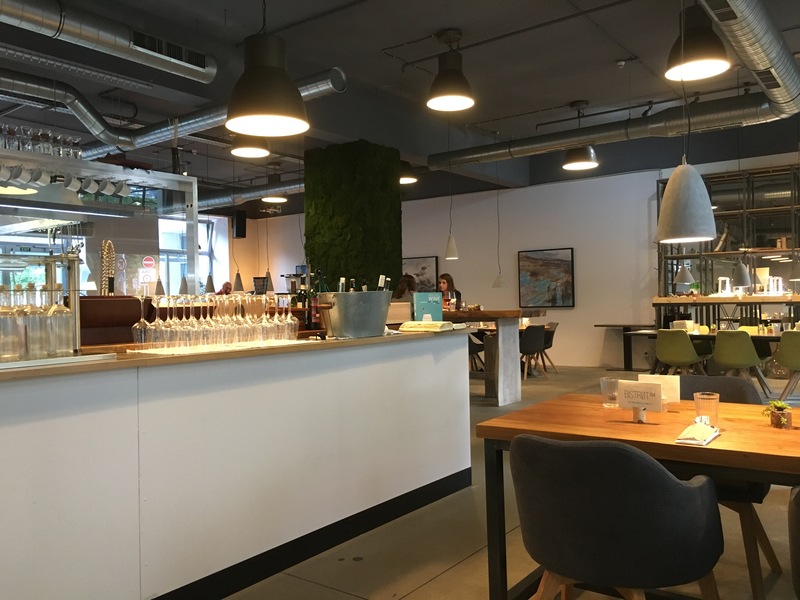 Bistrøt 104 opened in February 2017 but we only managed to visit on Saturday 17th June. 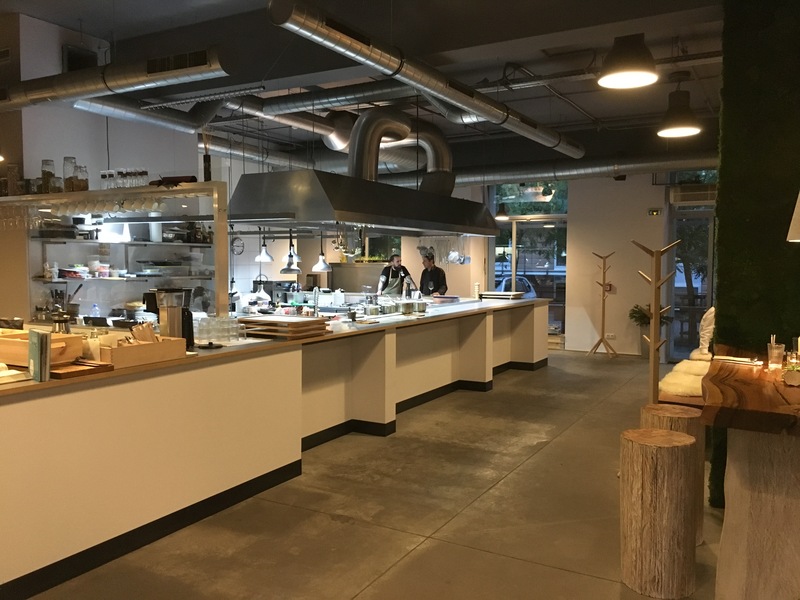 The ø in Bistrøt is to reflect the Nordic ideals of organic, local, seasonable and sustainable food. The 104 is just the street number and not a latitude or longitude point as I first thought. The Bistrøt 104 website is pretty sleek and has a professional video and mission statement. The menu is a PDF which is okay these days as most browsers have a built-in PDF reader – no need to download Adobe Reader. You can also make a reservation request on the website, which I did earlier in the same day and received an email response within a few hours. 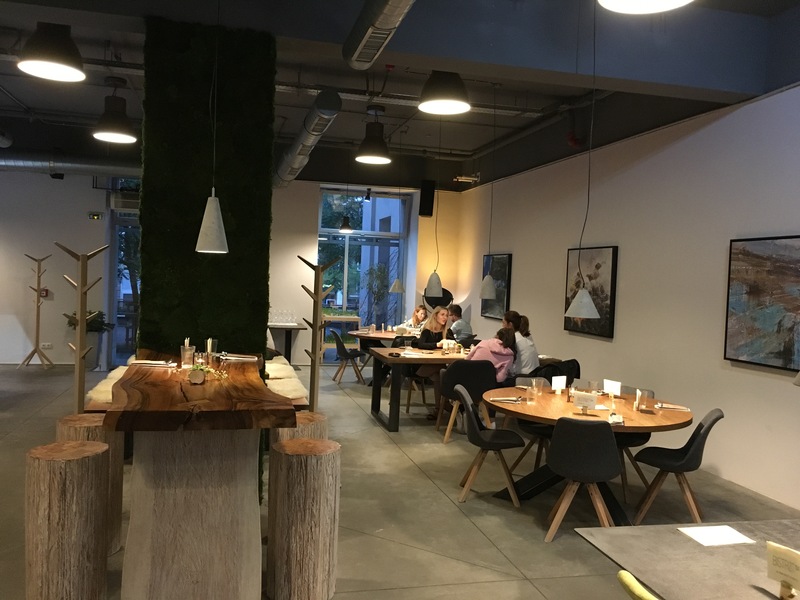 We were warmly welcomed on arrival at 19:00 and offered a choice of tables – the place was empty. At first we looked for a table for two and then realised that four was the smallest. (779Kc). The waiter was professional, but friendly and was more than able to discuss the wine we’d ordered. 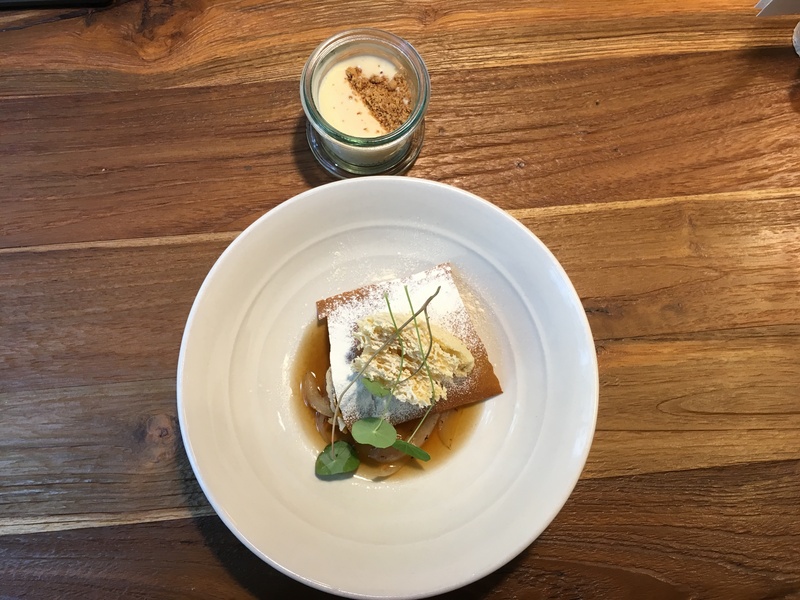 The waiter explained that portions were small and that we should order more than just a starter and main – or perhaps the degustation menu (1090Kc). We’d already guessed that from looking at their website. 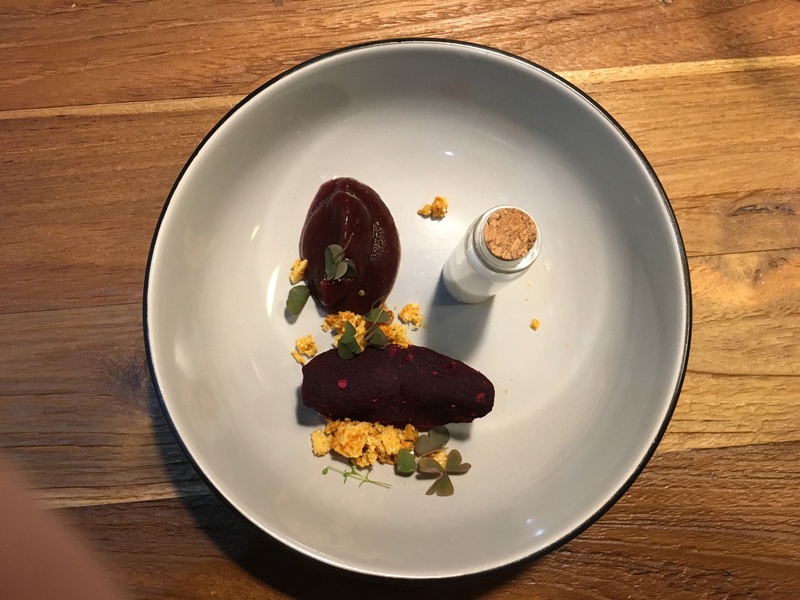 My personal view is that there shouldn’t be a traditional starter, main, pudding menu as Bistrøt 104 isn’t that kind of place. What I’d prefer is to be able to choose two starters, two mains and one pudding for a set price of, say, 900Kc. 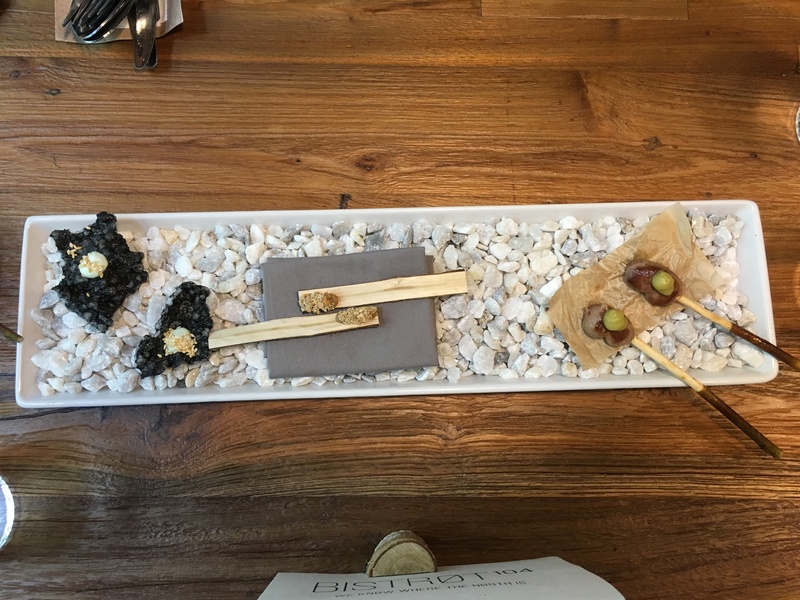 An amuse-bouche plate arrived; from left-to-right – tempura crisp with wasabi, pâté and (warm) liver. All were delicious. 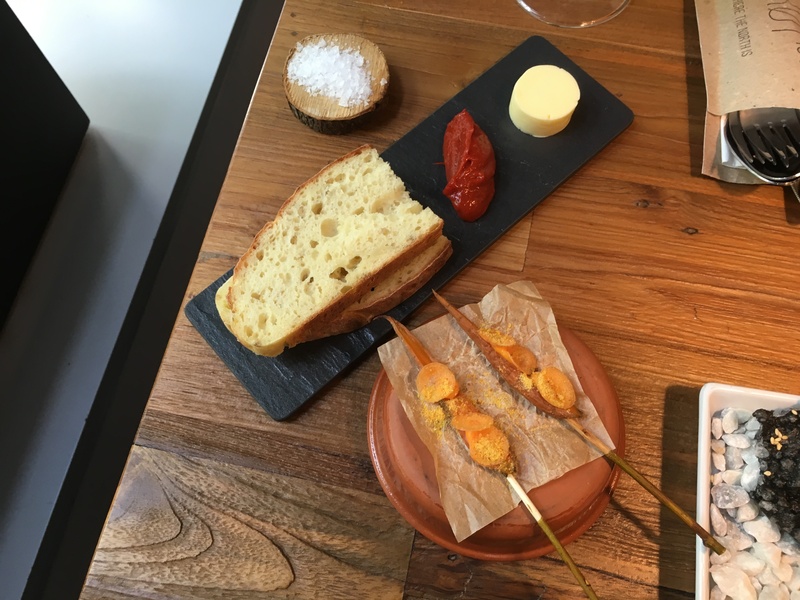 Bread arrived together with a second amuse-bouche (carrot). The tomato purée on bread wasn’t to my taste but my girlfriend liked it. Cold with three types of asparagus; white, green and wild. Everything was nice and beautifully presented – but it wasn’t amazing. A hot soup which had the wow factor that you look for in a place with Michelin aspirations. The waiter served the broth at the table. The top was a kind of edible paper. The separate jar contained onion foam. It was really good but was missing something that I wish I knew enough to articulate. This was a bit of a disappointment considering how much the Czechs enjoy foraging for mushrooms. Perhaps when the season enters full swing this plate would improve. 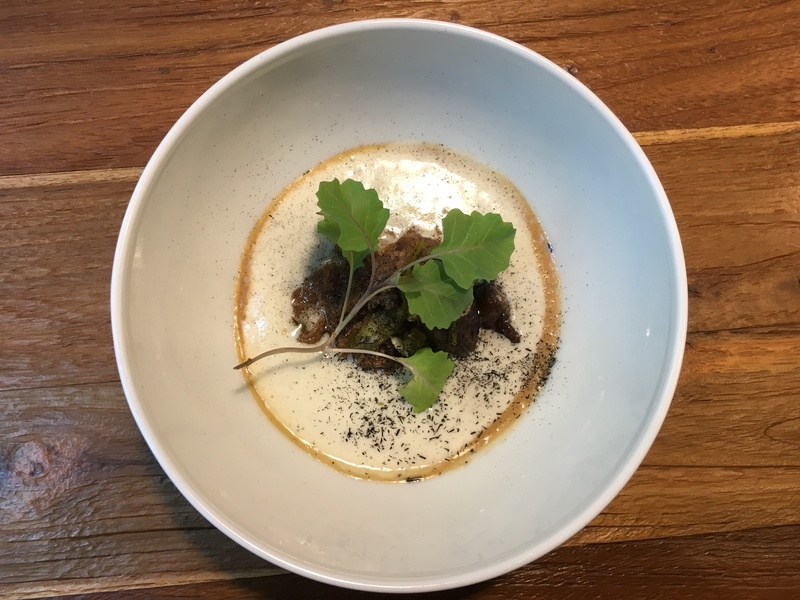 LAMB KNEE nettles seaberry horseradish – broth served at the table. I forgot to take a picture of this course but you can rest assured that the presentation was another delight. 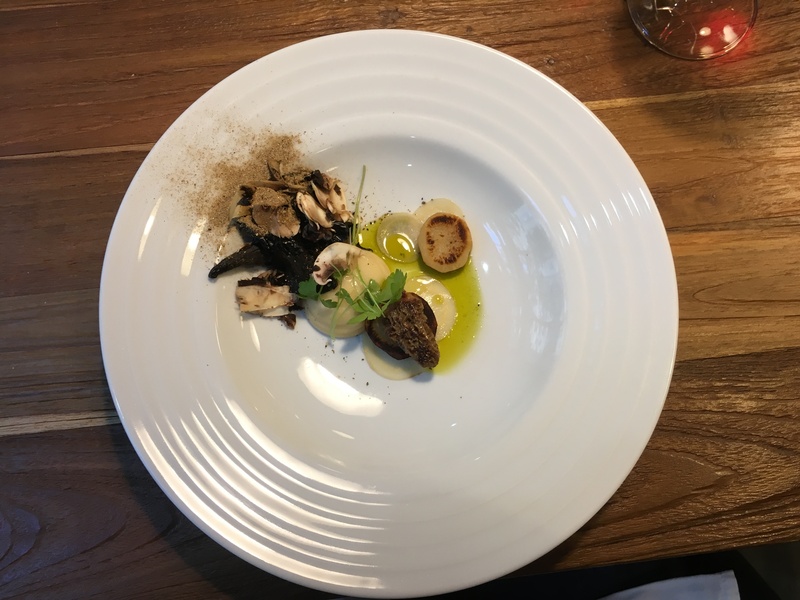 This dish was excellent and had the wow factor that we were looking for. The small kefir (like a drinking yoghurt) was delicious. The beetroot good but nothing special for me. 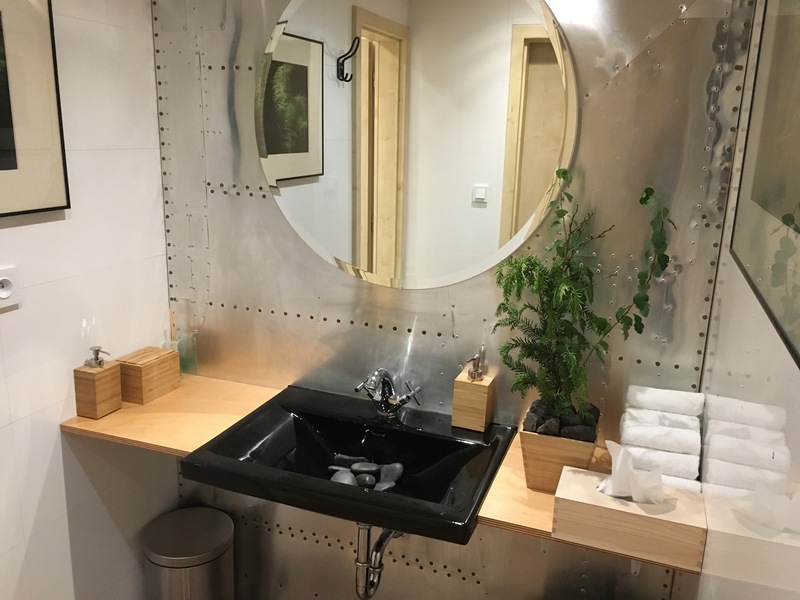 Modern, clean, stones in the washbasin, towels for hand drying, tissues, a small box containing toothpicks and cotton buds. Perfect. We declined coffee and digestifs and asked for the bill. So it was nice to still receive some lovely petit fours. The bill total was 3107Kc plus tip. I was disappointed to see an additional 50Kc per person cover charge and that our second bottle of filtered water (49Kc) had also been added. This at odds with the generousity of the amuse bouches and petit fours. It’s really unnecessary at this level to add a cover change and water should be free. We enjoyed our dinner. The staff were knowledgeable and friendly. 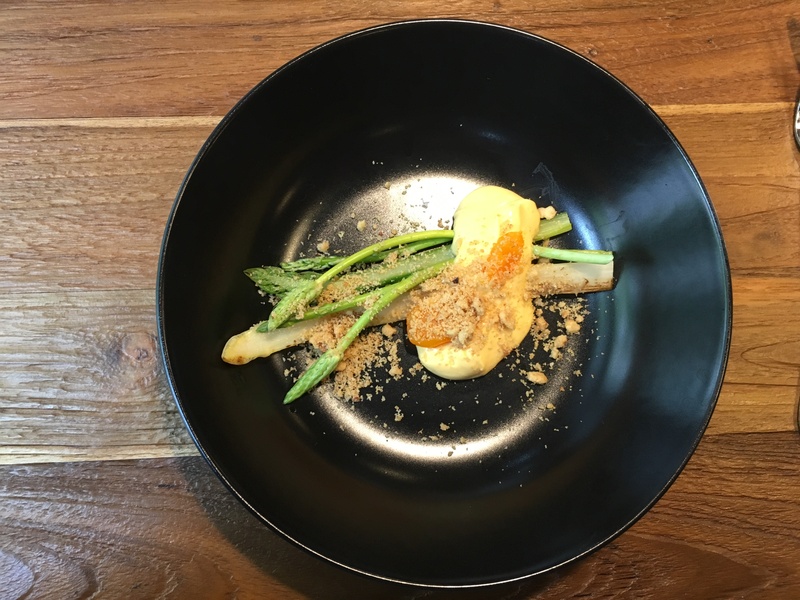 Some plates were exceptional, some not – although all were beautifully presented. It sounds as if I’m being over-critical, but at this level I expect to be wowed. Nickel and diming on the bill and inconsistent menu aside, this place does represent reasonable fine-dining value. 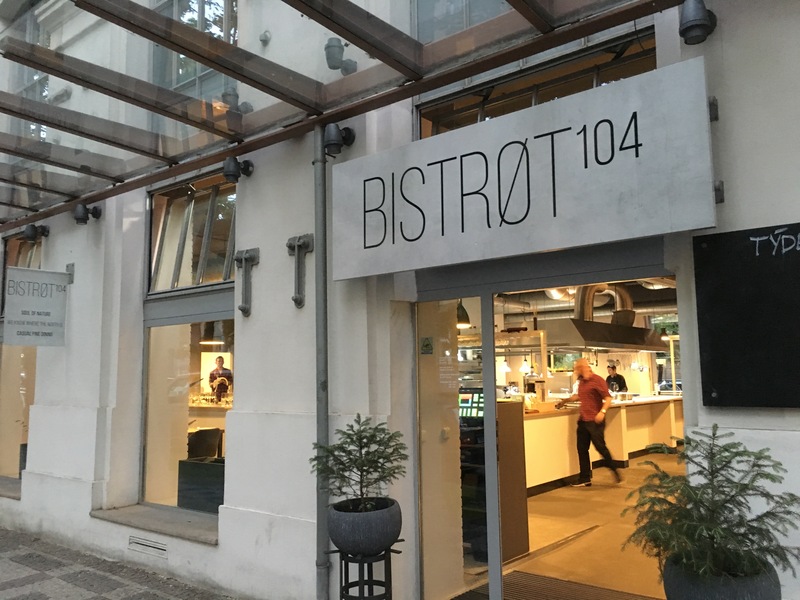 I wouldn’t surprised if Bistrøt 104 receives a Bib Gourmand in the next Michelin guide. 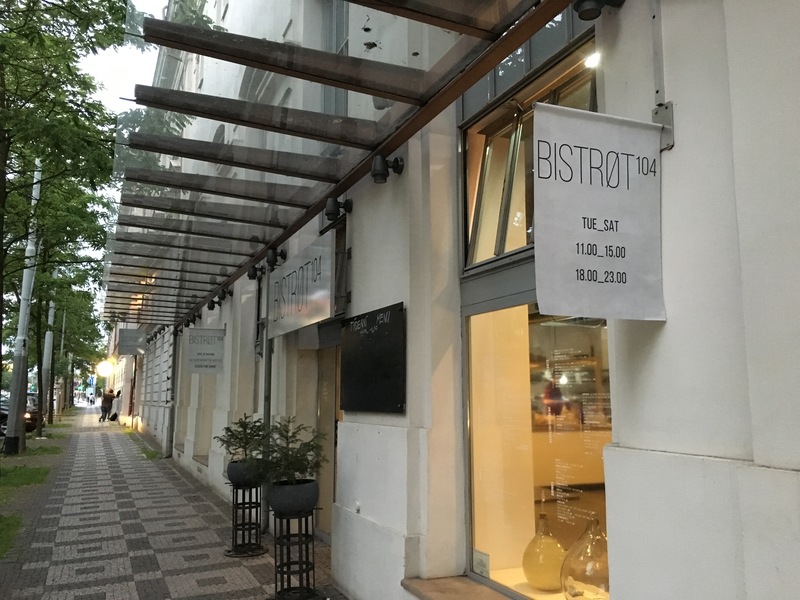 However, there are plenty of great restaurants in Prague and Bistrøt 104 would need to do more to tempt me away from the likes of Sansho, Yuniku and Cicala.